On Monday, when I posted Snapshots of Cleveland, 1910-1913, I noted that there was one photo I had omitted. This is the photo. 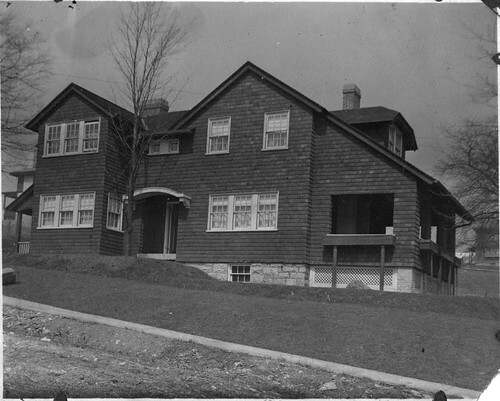 The house appears to have been new when the photo was taken. It appears to be on a bit of a slope, which should narrow down the location. Do you know approximately where it is (or was)? All guesses must be made as comments on this post. There will not be any clues, as, I must confess, I haven't been able to figure this one out myself. I think the frozen lake is behind the house in the picture. Wow! Good eye! What areas would share this geography and lake view? I've updated the post to link to a high-resolution version of the image. How about Lake or Edgewater Ave, right when you get off of Rt 2? A house on the North side of the street might have that view, and there is a little change in topography there. Could it be on Whiskey Island, or was there only shanty housing there? Otherwise, I agree with Edgewater Park neighborhood. Because all the other photos in the series are on the east side and the "cluster" of other houses between this house and the lake, I guess that the house was located in one of the lake front neighborhoods from the east end of Bratenahl to about East 156th Street. The hill could also indicate a creek or tributary draining to the lake such as Euclid Creek. It could also be further east where people built "camps" such as Euclid and Willowick. But to make a guess, I will say Villa Beach Drive in Collinwood.